Succulent Workshop Instructor Needed - Will Train! 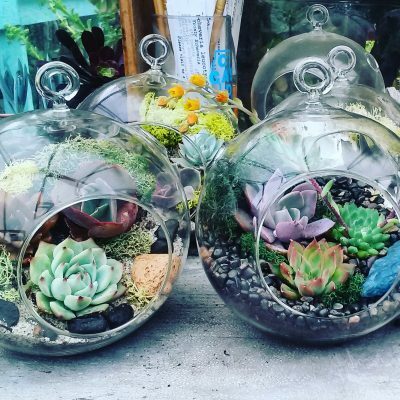 Sunshine & Succulents (www.sunshineandsucculents.com) has been teaching Succulent Terrarium Workshops for 5 years, and is the leading succulent workshop company in the Bay Area. We are looking to fill a part time workshop instructor position. On average, our instructor teaches 1-4 workshops per month. The workshops are mostly on weekdays (for our corporate clients) with a few on weekends (these are open to the public), so this position is for someone with a very flexible schedule; weekday availability is a must. The willingness to respond quickly to texts is also important, as I’ll be contacting my instructor regularly to check on his/her availability when I get workshop requests from my clients. The ideal person for this job will be outgoing and not afraid to talk in front of a group of strangers. They will have at least a tiny bit of experience with succulents, and will be excited to learn more about them. This job involves confidently sharing succulent care information with students, discussing design elements, demonstrating how to make terrariums, patiently answering dozens of questions from eager students, and holding students’ metaphorical hands as you convince them that they can keep their new plants alive. The right person for the job will be a quick learner, and will be able to tackle teaching on their own after a couple of training sessions- we will train you on the material. Prior teaching experience is a huge plus. Our new instructor will need to have a reliable, insured vehicle and be willing to drive to Petaluma to pick up the supplies for each workshop, and then throughout the Bay Area to our clients’ offices and event venues for each workshop. Some moderately heavy lifting is involved. Instructors will be provided with all the materials they need for each workshop. Our starting wage is $20/hour and covers travel time from our studio in Petaluma to and from the workshop location, as well as time spent packing and preparing supplies for the workshop. Each workshop generally involves 6-8 hours of time including preparation, travel, and teaching. Please submit a resume to hello@sunshineandsucculents.com and include a paragraph in your email that describes your experience with plants and gardening, with being a maker, and/or with teaching workshops. Please also include your weekday and weekend availability. If you have a website showing your creative or professional work, please share the link!